Its really a helpful and useful app. Thanks to the creator of this app and Jai Shree Krishna on behalf of all the Vaishnava Jan. 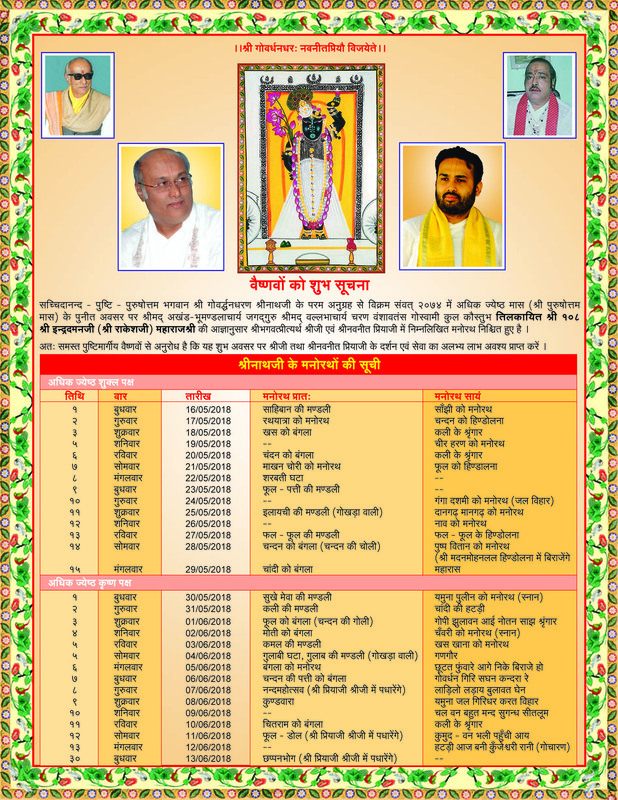 I am extremely elated to have all the facilities of nathdwara online and the site is very useful and convenient...i am very gleeful about the mail with shrinathji blessings on special occasions... Cheers! This app is really good. I would suggest to add "Choghadiya" on dashboard. That would really be helpful. Jay Shree Krishna! Jai Shri Krishna! All Glories to Your Devine Service and Internet Seva! Wonderful web site! 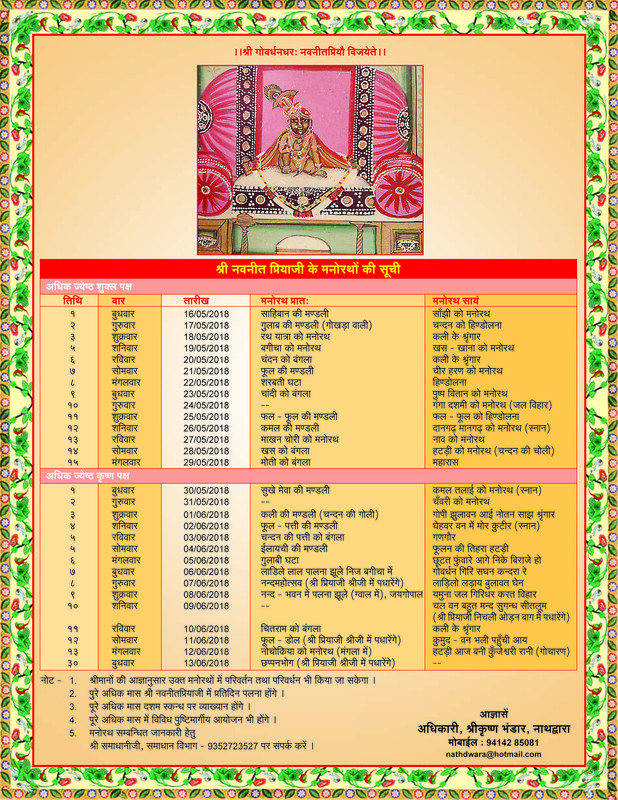 History pages about Shri Nath Ji doesn't work in English. Its ok ifs in process of translation... but if case its a programming mistake - just letting you know! Thank You! Jai Shri Nath Baba Ji ki Jai! Bathrooms in new cottage rooms can be kept more clean. The image of Shreenathji in the app startup has been degraded in quality perspective after a recent app update. Previously it was an HQ image. I need one room in sturday and sunday. What if I want to change or cancel the booking? Require 30 room from 09/12/2017check in 9.00am and check out 12/12/2017 8.00am.ie for two days.full family coming for darsan. We want to book 2 Rooms on Dt:15th JUNE, 2017 To 19th JUNE, 2017. Arrive at 8.30 PM on 15th JUNE. What will be the climate in Aug 2017. Will it be comfortable for stay and have darshan of the Lord? How to book room for a day in 1st week of august? Please banned "Pan Masala, Gud ka etc. in Temple Premise. Thare are some Temple staff also carrying Pan Masala & Gud ka in Premise. Please consider the suggestion. Jay Shree Krishna. I am unable to book rooms. Pls help. for rooms for 2 nights 3days we are fifteen members. 76. jayesh. M . Amin . Book a room sir.... . I want to book room..How ? I don't know...Plz give me guide .I want to book room..How ? I don't know...Plz give me guide. 79. jayesh. M . Amin . when ever i try to book room getting not available room for the A.C room. .
Can we make payment after the arrival? Is there any such option? need a ac room for august . We are 6 adults and 2 children , we are planning to come nathdwaraji at evening and want to stay at New cottage. So please told us how we book. We want two bed room for four persons . We will reach at their on 25 may 2017 at 8.00 p.m.
All rooms of Damodardham , Dhirajdham and New cottage should be allowed online booking. I am usually staying at Damodardham, but housekeeping and cleaning are not satisfactory. You should give attention on maintenance strictly.